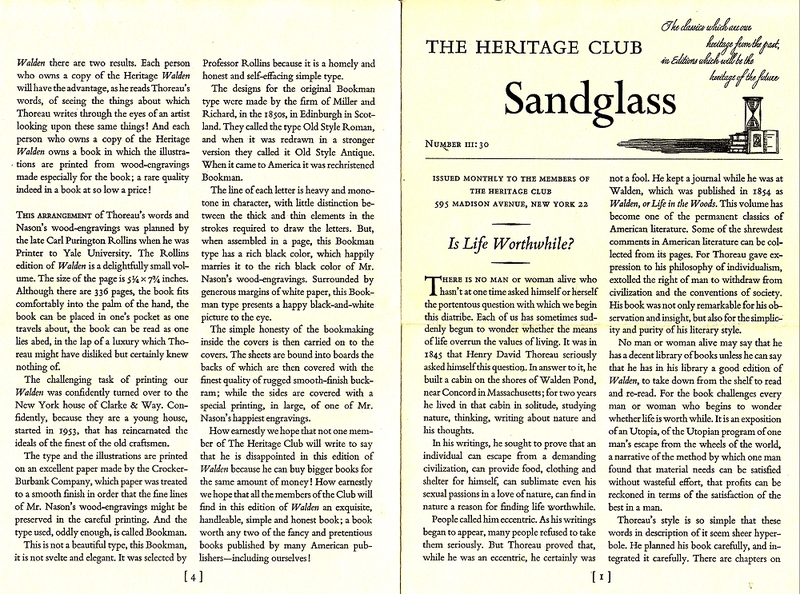 Heritage Press Exclusive: The LEC would issue their own Walden with Edward Steichen’s Walden Pond photographs in 1936. 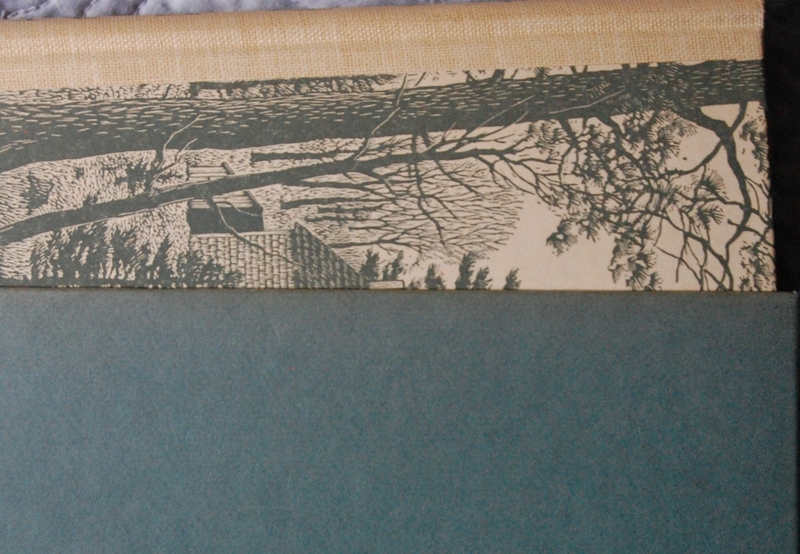 Front Binding – Book #2 for today is the Heritage Walden. Thoreau’s seminal nature writings continue to inspire and influence people today, even if you find his personal reasoning and methods of living with nature a bit dubious. The Limited Editions Club had Edward Steichen’s Walden Pond photographs provide its visuals, but the Heritage Press went for a more natural approach, asking wood engraver Thomas A. Nason to supply their edition with woodcuts. Nason’s work is quite apropos, and he would see two future LEC commissions come his way. 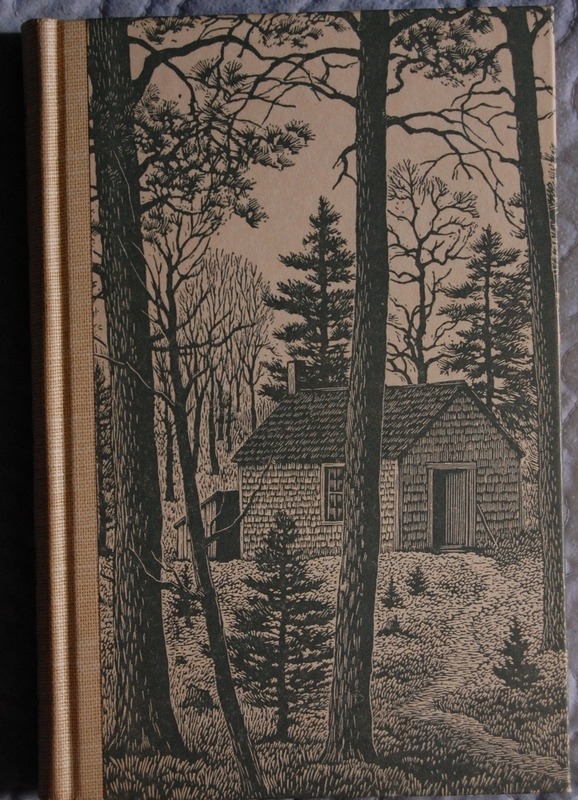 He did the Poems of William Cullen Bryant in 1947, and his last was a doozy; The Complete Poems of Robert Frost, a 2 volume issuing in 1950 that Frost, Nason and designer Bruce Rogers all signed, which automatically skyrockets it into the more coveted and expensive LEC’s out there. 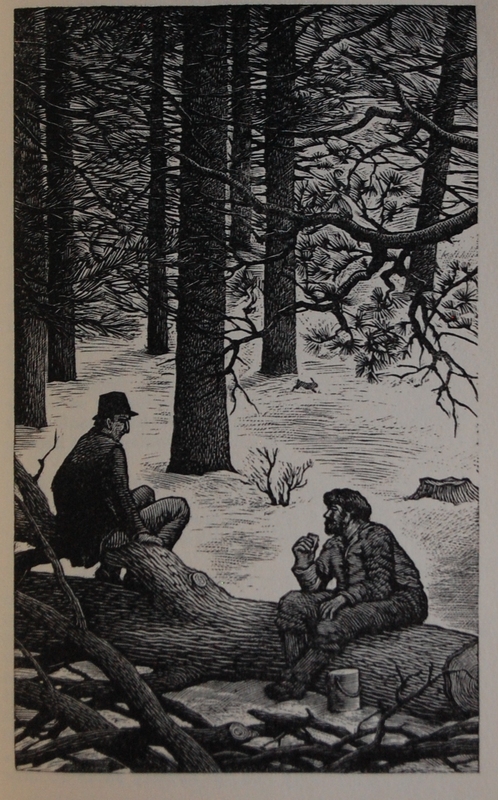 Thoreau’s Walden LEC release in 1936 would be the last under George Macy; in fact, Helen and Jonathan Macy barely got the next one, Cape Cod, out under their tenure in 1968. Raymond J. Holden would render that one artistically. Cardevon Press recruited Holden again in 1975 for their A Week on the Concord and Merrimack Rivers LEC in 1975. That’s all for Thoreau! Designing info for you: Carl Purington Rollins was the original designer back for the original issuing. Clarke and Way printed the work on Crocker-Burbank paper. Bookman is the font of choice. That’s all the Sandglass provides! Title Page – I happen to like Nason’s work a lot. 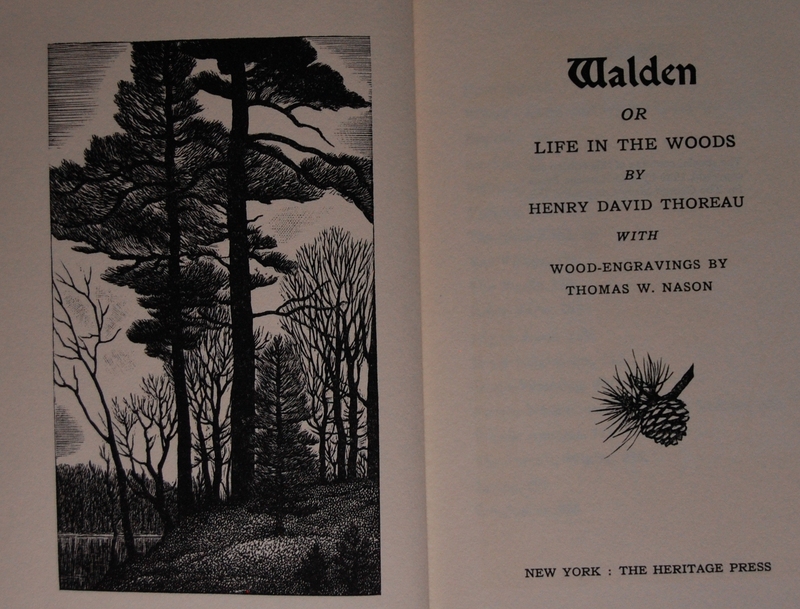 The full-page engravings are loaded with little details that fit the world of Walden like a glove. There are many more small cuts, which are also excellent. A good fit! 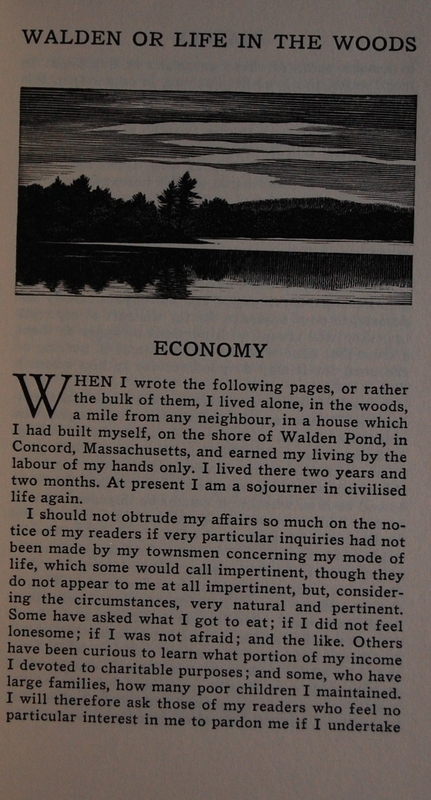 There is no preface or introduction to Thoreau’s text; it just starts right up! 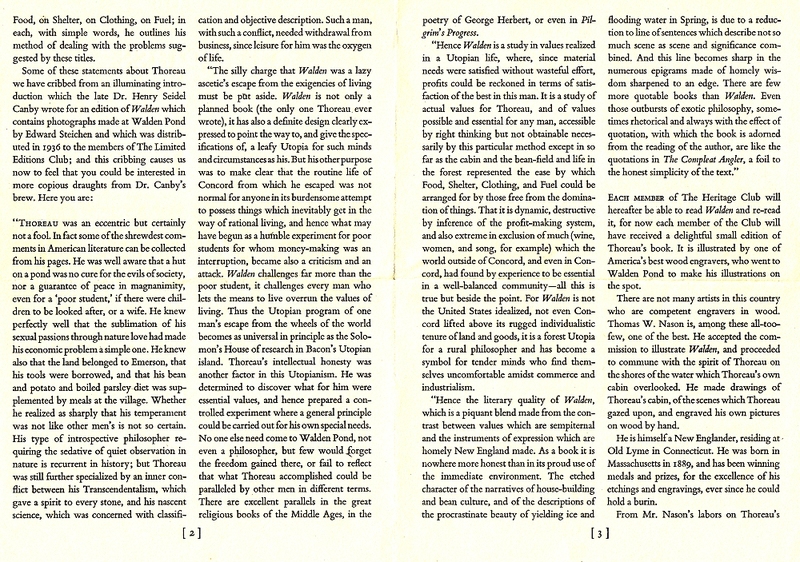 Page 13 – The first page of the book. These miniature illustrations are scattered frequently throughout the book. Page 147 – One of the few Nason full page etchings. Personal Notes – I’ve owned two separate copies of this book. The first I don’t fully recall how it sneaked into my inventory. It was ratty and beat up! If my memory serves, I believe I got it from Windows on the World Books & Art (RIP), my second bookselling gig, for a really low price or free. The one this post features is my second, much nicer copy. I snagged that at a library book sale. Haven’t read it yet. My favorite book shop closed its doors last year, and I mentioned that I would devote a special post to its memory. Well, this is that post. I’ve since discovered that another gentleman, a Mr. Matthew Sundt, has purchased the business and rechristened it Old Captiol Books, so I’m pleased to hear that the store’s core remains. However, I still want to devote space to giving Book Haven a proper eulogy. Book Haven was a magical place. It was the realization of the perfect dream bookshop for me. Tons upon tons of books, many classics, many Heritage Press and Limited Editions Club titles, and super-friendly proprietors. It was a delight to step inside and experience the wonder of books. It was where I purchased my very first LEC, Man and Superman. I would go on to purchase The House of the Dead, The Oresteia, Three Men in a Boat, The Three-Cornered Hat, Saint-Simon’s Memoirs, Far from the Madding Crowd, and Twenty Years After. All had the same number, #403, which I think is pretty nifty. Hopefully, Old Capitol is still selling some of the remaining stock so I can continue to expand upon those. 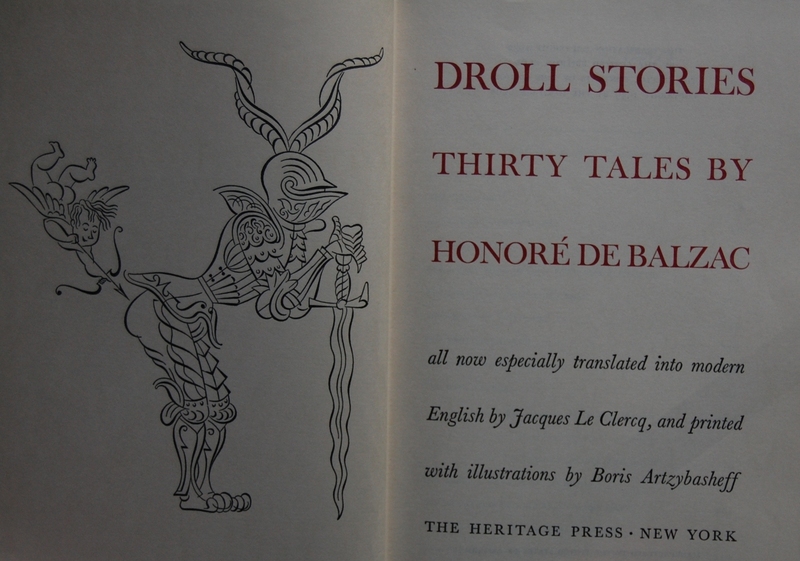 Heritage Press books were a huge part of the store’s classic inventory, and I ran off with many of their better selections, including the original issuing of Manon Lescaut. Along with that, my Heritage collection from Book Haven included Resurrection, The Nibelungenlied, The Narrative of Arthur Gordon Pym, Elegy Written from a Country Churchyard, The Birds and the Frogs, The House of Seven Gables, The Possessed, A Journal of a Plague Year, and The Ambassadors. I also got my Heritage Saint-Simon from them. 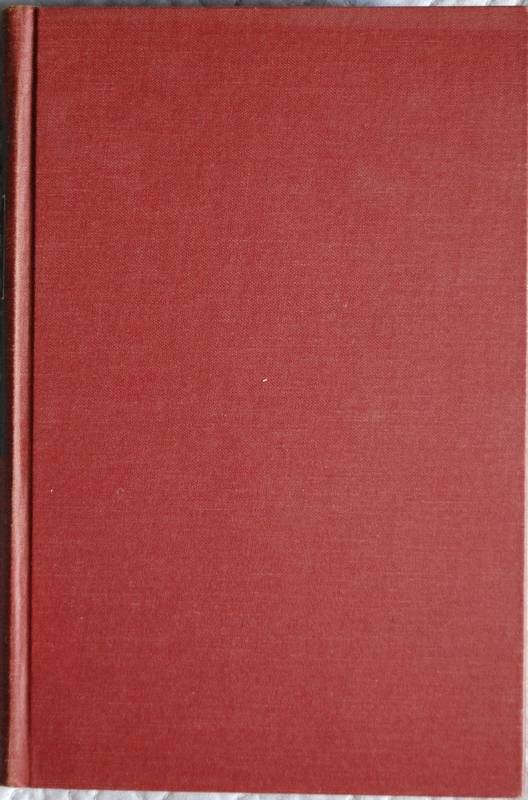 Their prices were quite reasonable, $10 – 15 for a book, depending on condition and completeness. The owners were a delight to discuss books with, too. We had a few really amazing conversations about their LEC history (including hearing about the lovely Fahrenheit 451), and they were kind enough to help us out when another local bookshop’s buyer was absent on a trip, taking a look at our books and giving us money for some of them with little warning. So, while the shop lives on as Old Captiol, the memories of Book Haven will always be ingrained in my mind. I wish prior owners Guy Rodriguez and Jerry Welling the best in their retirement, and look forward to checking out the new shop to see how Mr. Sundt runs his business. You are currently viewing the archives for January, 2013 at The George Macy Imagery.